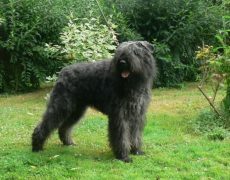 A herding breed, originating in Belgium’s Flanders region, the Bouvier des Flandres was originally used in the farm for a host of tasks. 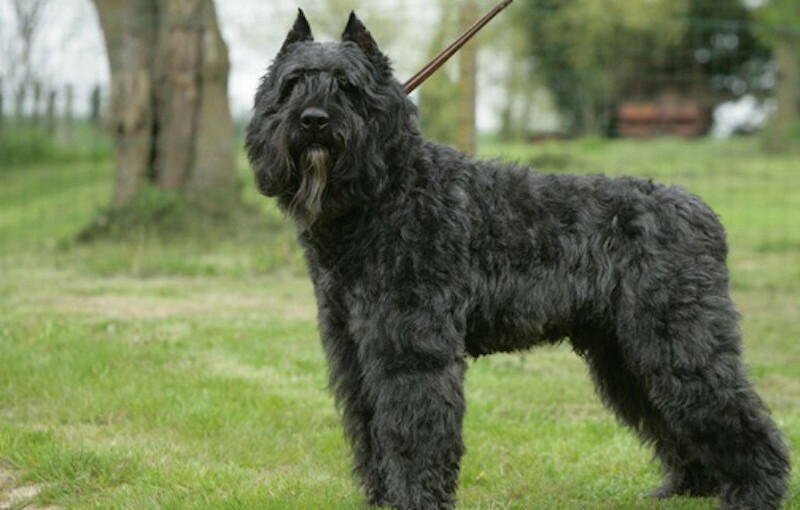 Their name translates to the “Cow Herder of Flanders” in French, and at present, they are employed as guard and police dogs. 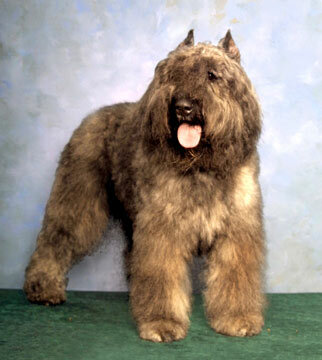 Besides its powerful built with a rugged and robust appearance, it also has a large head, oval-shaped eyes with an alert and bold expression, high set ears, broad and robust muzzle, broad chest and a high set tail carried upwards. 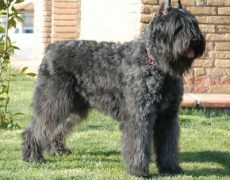 Agile and fearless, well-behaved and affectionate, it functions as a family as well as a working dog with great ease. Bred as farm dogs for protecting livestock, the monks residing at Ter Duinen monastery located in Flanders were said to be involved in the development of this breed by crossing the Scottish deerhounds, Schnauzers, Griffons, and Irish Wolfhounds with the local farm breeds. The demand for a versatile dog by the thrifty French farmers increased the popularity of this breed whose role did not just pertain to tending and driving cattle but also pulling carts as well as watching and guarding their properties. 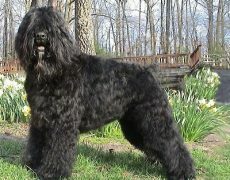 After two dogs of this breed were presented at an International dog show, they caught the attention of several dog fanciers. 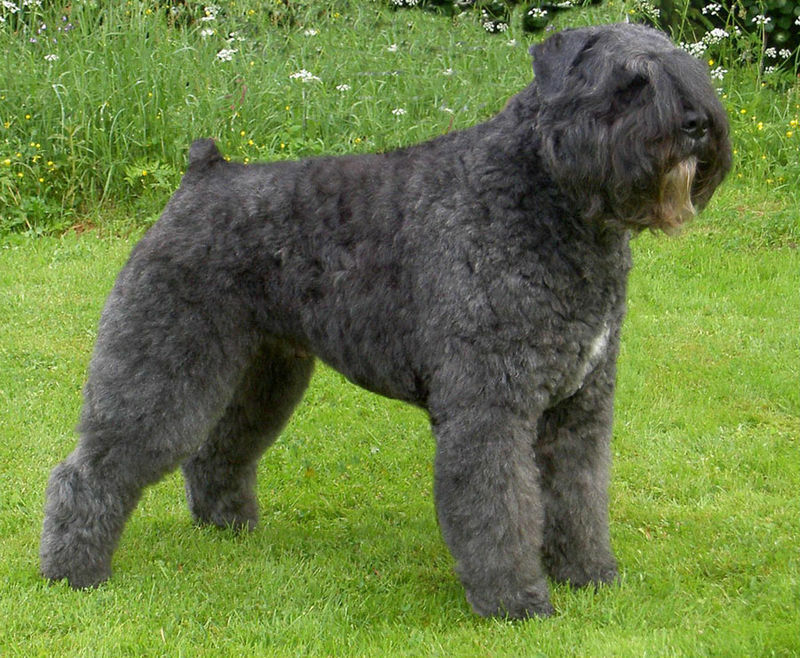 From 1912 to 1913 many clubs came together to define a specific standard for this breed. Post the First World War their numbers declined rapidly since the farming population was displaced. 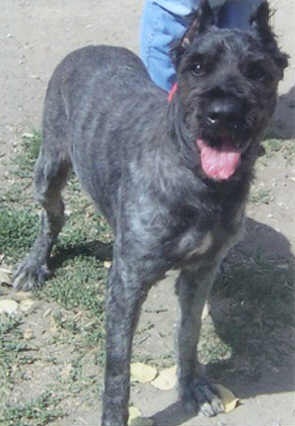 However, some breeders had retained their pets, and the remaining population served as messenger and ambulance dogs. Ch. 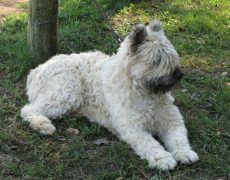 Nic de Sottegem, a dog of this breed belonging to a captain of the Belgian army, was said to be one of the major representatives and founding stocks of this breed. 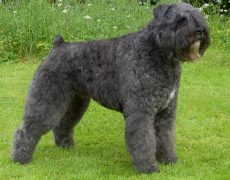 It attained AKC’s recognition and gained entry into its stud book in 1929 and 1931 respectively. 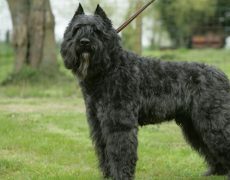 Post the Second World War they were again at the risk of endangerment, but for the Belgian army who made good use of these courageous dogs. 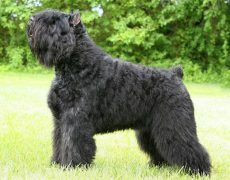 Their popularity in the United States increased during the 50s and 60s, and the American Bouvier des Flandres Club was developed in the year 1963. 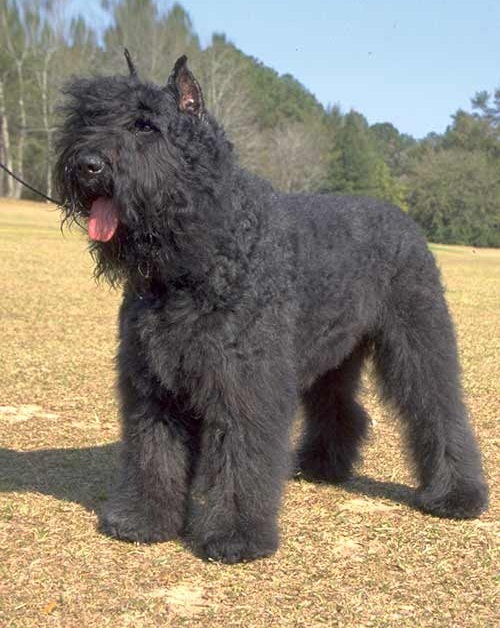 Presently this one is the only of all the Belgian breeds to remain in measurable numbers as the other Bouvier breeds like the Bouvier de Paret, Bouvier de Moerman, and Bouvier de Roulers have become extinct. Steady, fearless, courageous, but loyal and gentle… these are the traits which describe the Flanders Cattle dog the best. 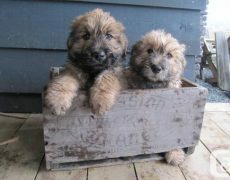 They are a dignified and sophisticated breed, loving to be in the company of their near and dear ones. 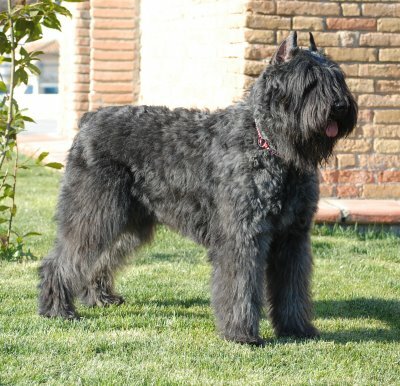 Its calm, gentle, appearance could be deceptive as behind it lies a protective dog which is aloof and reserved towards strangers, intimating their owner at the moment they recognize any threat. 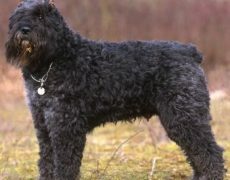 This trait of theirs raises them to the stature of an excellent watch and guard dogs, also making them be used in the police department as K-9 dogs. 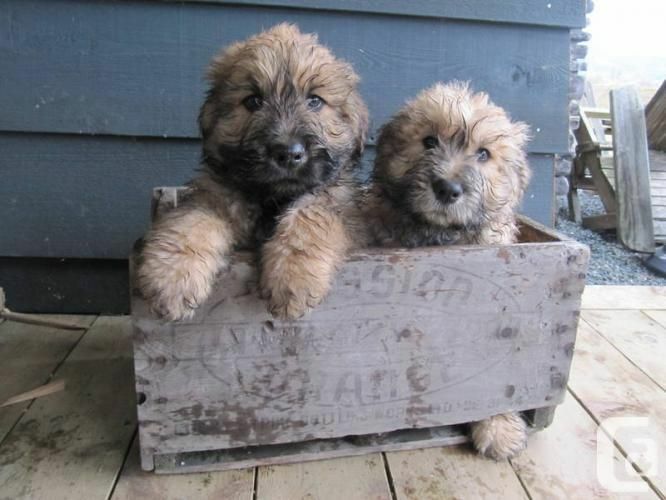 They are a great playmate for kids though little ones require supervision as they (especially the puppies) might get boisterous and rambunctious during play. 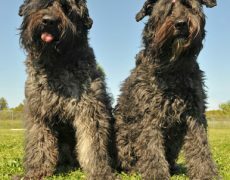 These herding dogs could share a comfortable rapport with other dogs particularly if brought up with them, however, they might get aggressive with unknown canines. Cats and smaller animals could trigger their chasing and herding instincts. Hence it is safe to keep them out of their reach. 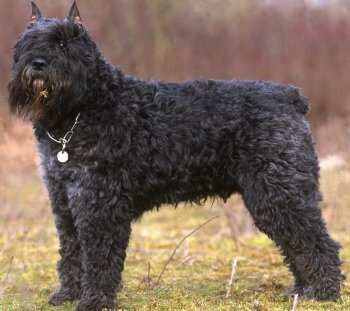 Since they developed as working dogs, the Bouvier has high exercise requirements and stay physically as well as mentally energized when they get sufficient amount of exercise. If you live in the countryside and have livestock to tend, then you know whom to assign the job. 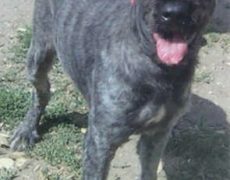 However, if they lead an apartment life, make sure you take them out on a long walk and also give them sufficient playtime in a fenced yard. 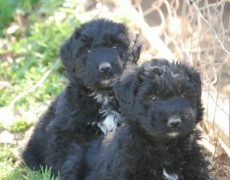 They would also be your perfect companion when you are out for hiking, jogging or biking. 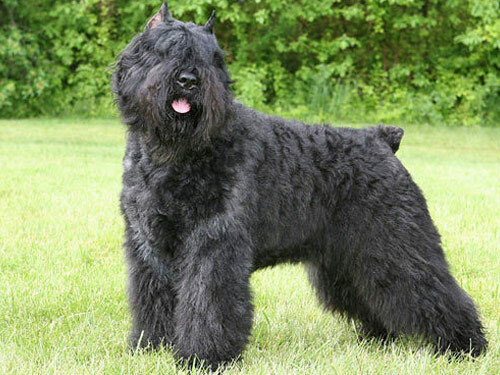 If bored your Bouvier could resort to destructive activities like barking unnecessarily. 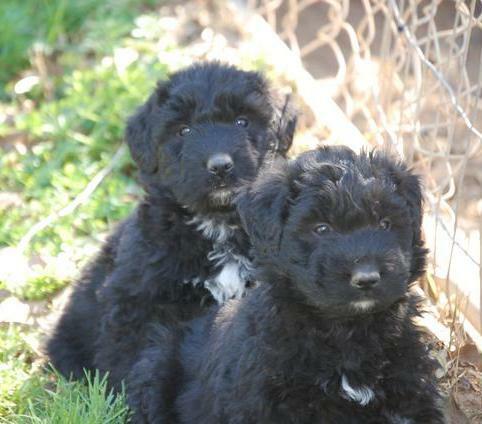 They can also be made to participate in sports like carting and agility, whereas their herding instincts make them eligible for herding trials. 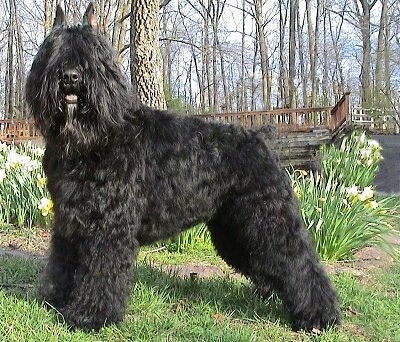 Their thick coat needs to be brushed at least two to three times a week using a pin or slicker brush as well as a large comb to prevent the formation of mats and tangles. Its beard and mustache which is responsible for its dark and serious look need to be cleaned after every meal so that water and food particles do not accumulate on it. 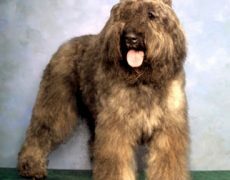 Trimming its nails, cleaning its eyes and ears and brushing its teeth regularly are the other grooming requirements that must be followed. 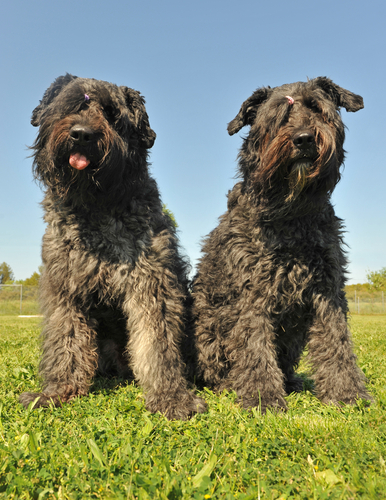 They may be prone to hip dysplasia, cataract, glaucoma, hypothyroidism, subaortic stenosis (a heart ailment), and laryngeal paralysis. 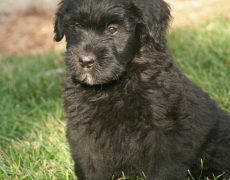 Because of their large size and deep chest, they also have an increased chance of suffering from bloating and dilation. Though intelligent, they tend to have a will of their own and sometimes display stubbornness especially when made to do an activity repeatedly. 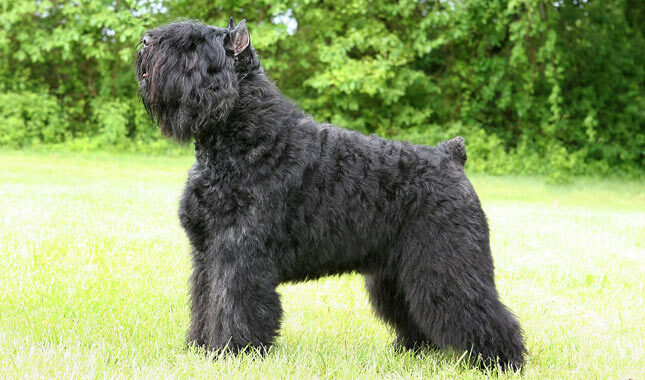 Hence the training process should not be methodical but filled with a lot of fun activities to hold on to your dog’s attention and the trainer must be firm while handling this breed. Socialization: Being reserved towards strangers is a good thing, but they should know whom to bark at and whom to greet in a friendly way. For this, they need exposure to diverse kinds of people with different physical features. Take them to several places and let them get acquainted with a lot of new experiences. What they see around them would get into their mind, and in this way, they gradually learn to differentiate a friend from a foe. 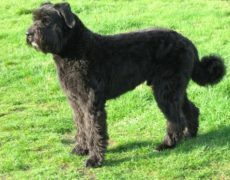 Obedience: Training your dog on the basic commands like “sit”, “wait,” “no”, “stop” since its puppy days would help in controlling its stubborn behavior. Before teaching it any command, it is essential to get it to focus upon you for which you can hold a treat up to its face, and in case it does not pay attention, place it in such a way between one of your fingers and thumb that your pet can smell it. Gradually move it to the level of its eyes, call out its name and say “Watch me”, sternly and firmly. Once its focus is on you for at least five seconds reward it. Doing this on a routine basis would make your dog concentrate during training, and it would be rather easy to teach it any command. 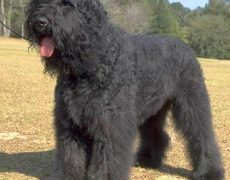 Good quality dry dog food would be an apt choice for your Bouvier des Flandres. 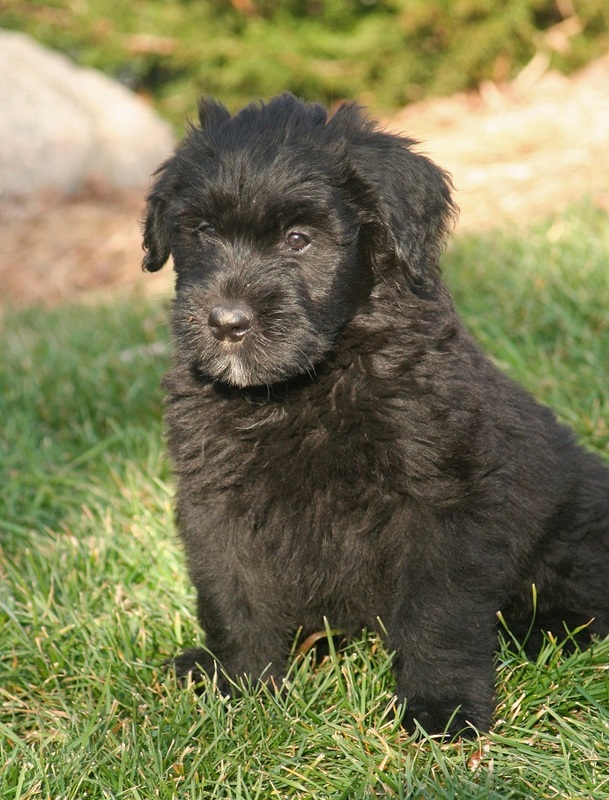 Take caution in giving it a measured amount of food as it might aggravate bloating and hip dysplasia. They have made their appearance in several novels and films like the Presidential Agent series by W.E.B Griffin and A Dog of Flanders by Marie Lousie. The 40thS President Ronald Reagan and his wife Nancy were the owners of Lucky, a Bouvier.